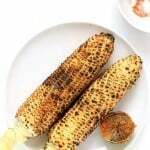 Indian Roasted Corn on the cob - Street style Butta or Bhutta Recipe with lime juice, red chili powder, ground cumin and chaat masala. Easy BBQ side. Summer corn recipe. Remove the corn husk and strings from the corn. Roast the corn on the grill or open gas flame (gas stove) at medium high heat. Move it around every 30 seconds or so, so the corn gets roasted evenly. You will hear some kernels pop. All the kernels will blacken to varying degrees. Mix all the spices in a bowl. Use a half lime to dip in the spice mix to pick up the spices and rub all over the corn, making sure to squeeze lime juice while doing so. For variation: Rub Mint cilantro chutney all over.